Paint your life a Masterpiece! Grow a friendship as you sow this season's tomatoes and zinnias in Someren Glen's community garden. Craft meaningful conversations as you learn new skills in our well-equipped woodshop. Enrich your spirit through study with our Chaplain and your peers. Enhance your fitness through our popular Stretch & Balance or Tai Chi classes. We'll partner with you in aging vibrantly. Through Someren Glen's Masterpiece Living program, you'll find unique, resident-driven, engaging programs that feed residents' spiritual, intellectual, physical and social growth. 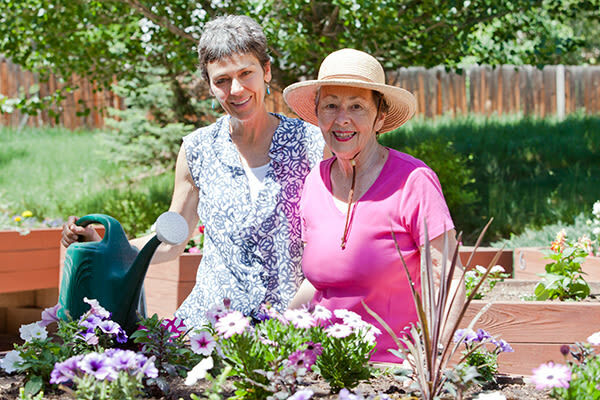 It's more than our life enrichment programming — it's our foundational approach. Masterpiece Living grew from a ten-year study on aging by the MacArthur Foundation. This study conclusively demonstrated that successful aging depends more on lifestyle choices than on our genes. We believe that Masterpiece Living means taking advantage of opportunities to stir up your life and to make the most of it. Christian Living Communities, Someren Glen's parent organization is proud to have the only three Masterpiece Living Communities in Colorado. For general information about Masterpiece Living, visit their website.